Based on the amazing graphic novel by Alan Moore, V for Vendetta is a tale set in the not so distant future where the British government run the country as a totalitarian state through its military power. There is however one citizen named "V", a man who hides behind a mask who may be the savior for the country. Unfortunately he has been labeled a terrorist by the government, however through the eyes of the society, he is a hero to some. 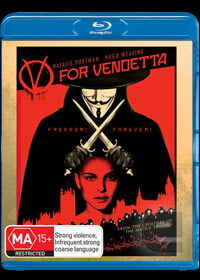 When Evey (Natalie Portman) is drawn into this oppressed world of darkness and misery, her path crosses with V (Hugo Weaving) and eventually she becomes his ally in an attempt to usurp the government's power. In a deadly game of cat and mouse, Chief Inspector Eric Finch (Stephen Rea) has vowed to bring "V" to justice in order to prevent any civil unrest and potential revolution. The movie is quite faithful to the comic book with a strong ideology about where society is heading, hence the comedic reference to the current politically times. At its heart, V for Vendetta is an interesting science fiction movie that contains quite a strong story and some outstanding special effects that is complimented with the stunning cinematography. With amazing Blu-ray video quality and exceptional audio quality, this is definitely one impressive disc and the colour palette of the film is amazing, especially the contract of colours. The film also offers some interesting featurettes from the the Making of V for Vendetta to the original story of Guy Fawkes which this film does parallel at times. The favourite special feature of mine was the Director's notebook which is a highly informative featurette about the processes used to create this strong science fiction movie.